Light and darkness blur as two young women stand on the brink of an interplanetary war. Only a week ago Grey Alexander thought she and her sister were orphans. And like everyone else she believed Jupiter was uninhabitable. Now she’s standing on its surface, reunited with her mom and dad and on the brink of an interplanetary war. The government of Mazdaar is ruthlessly determined to claim Jupiter like they already have Earth, but Grey has joined her parents and Commander Fleur March in the Yien Dynasty’s resistance effort. Jupiter, where extinct animals roam free and seem to have an uncanny ability to communicate with her sister, is the last hope for the freedom of mankind. When Mazdaar unexpectedly descends with a fleet of their terrifying Triangle jets, Grey and her family barely escape with their lives. Cut off from reinforcements and traveling in a ship full of strangers, who can they trust? Surely not Dana Yurkutz, the traitorous prisoner who even though she inexplicably saved Grey’s life is still loyal to Mazdaar. Deception is their enemy’s most powerful weapon, and light and darkness soon blur on this new frontier. Nothing is as it first seems, and Grey and Dana must each choose sides before it’s too late. 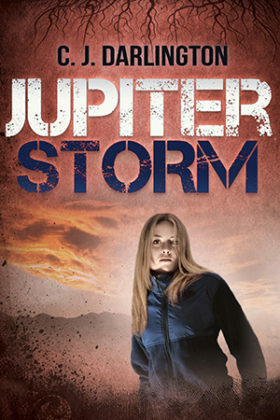 Book 2 of the Jupiter Winds series.